WATERLOO – Robert Gordon has been appointed as vice-president: research at Wilfrid Laurier University, effective November 1, 2015. Gordon has served as the dean of the Ontario Agricultural College and a professor in the School of Environmental Sciences at the University of Guelph since 2008. Prior to his role at the University of Guelph, Gordon spent a decade at the Nova Scotia Agricultural College (now Dalhousie University), where he held a Canada Research Chair in Agricultural Resource Management and served as dean of research, department head, and as associate professor in the Department of Engineering. 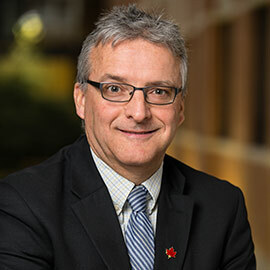 As the vice-president: research at Laurier, Gordon will lead the Office of Research Services, providing vision, strategy and support for Laurier’s overall research endeavours. “We are delighted to welcome Dr. Gordon to Wilfrid Laurier University,” said Max Blouw, president and vice-chancellor. “Dr. Gordon is a leading authority on environmental issues in Canada, and he has clearly demonstrated the research and academic leadership skills that will be important to support strategic growth of research activity at Laurier." Gordon holds a bachelor’s and master’s degree in Engineering from McGill University, and a PhD in Land Resource Science from the University of Guelph. The author of more than 100 peer-reviewed articles and supervisor of more than 50 graduate students, Gordon’s experience also includes leading the environmental management section of the Nova Scotia Department of Agriculture and administering the Nova Scotia Environmental Farm Plan Program. Among his numerous past and present appointments and leadership roles, he is a current board member of the Rural Ontario Institute and a board member of the Agricultural Institute of Canada and past chair of the Canada Committee on Natural Resources for the Canadian Agriculture Research Council. He has been recognized with a number of awards, including the Premier’s Award of Excellence in Nova Scotia, and the Nova Scotia Agricultural College faculty research excellence award. On November 1, Gordon will succeed Deborah MacLatchy, Laurier’s vice-president: academic and provost, who has been serving as acting vice president: research since November 2014. Donna Kotsopoulos served as acting associate vice-president: research from November 2014 to July 2015. In addition to his five-year appointment as vice-president: research, Gordon will hold a faculty position in the Department of Geography and Environmental Studies.